Chronome Prototype from FlipMu on Vimeo. The monome is defined as much by what it isn’t as what it is: it’s monochromatic, it uses only on/off binary buttons, and that’s part of its beauty. But what if it weren’t that? 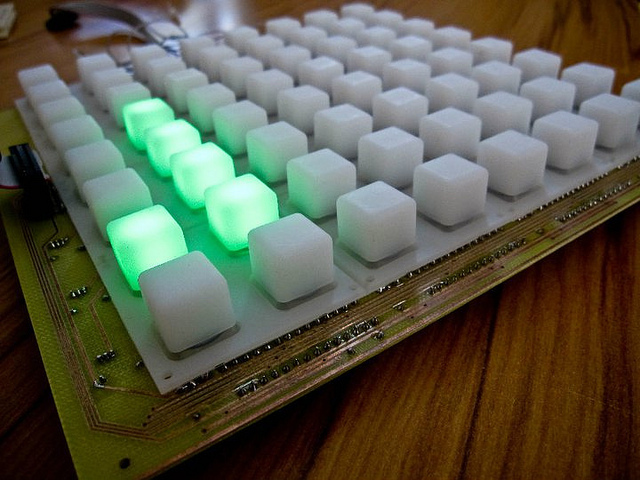 What if a monome could do color, and velocity sensitivity? As both engineering problem and design inquiry, that question holds some intrigue. Owen Vallis, who with Jordan Hochenbaum makes up the digital duo FlipMu, shares the Chronome prototype. Like the Arduinome before it, it re-conceives the monome’s brain around the open-source Arduino microcontroller platform – now in the form of the beefier MEGA. But moving beyond RGB lights, it adds pressure sensitivity via conductive fabric (an idea that could be extended elsewhere). More on this project to come, I hope.